Select the right Cummins generator for your needs. The Quiet Connect series of standby generators are perfect for residential backup service. Both one and three-phase models are available, and they generate anywhere from 22 Kw to 100 Kw. There is an appropriate Cummins generator for virtually any residential need. Cummins has put considerable effort into making its residential backup generators among the quietest in their class. Its Advanced Enclosure Design will also withstand winds of 150 mph. When service is required, it is easy to access the unit for quick and efficient checkups and maintenance. Cummins’ Flexible Exercise Mode allows you to choose both the time and the length of test runs that keep your unit operating efficiently. Using this special exercise mode, it is possible to save money, reduce unwanted sound and avoid excessive fuel use. Cummins PowerCommand© allows for both easy service and automated self-diagnostics. Cummins cites data suggesting that 14 million Americans lost electrical power for at least 24 hours in 2013. That is a sizeable portion of the population. From 2009-2013, approximately 3,000 power outages occurred every year, impacting anywhere from 13.5 million to over 41 million individuals. What Causes These Power Outages? Natural disasters – At sub-freezing temperatures, rain freezes to surfaces on contact. Ice accumulates on power lines and tree branches. The sheer weight of the ice brings down certain power lines, while others are toppled by falling trees and branches. Severe ice storms may leave tens or hundreds of thousands of people without power for days. Extreme winds also take down power lines in severe thunderstorms, tornadoes and hurricanes. Construction errors – Overhead wires are vulnerable, and so are those found underground. All it takes is one misstep by a backhoe operator to cut an underground power line. When this occurs, repairs can take many hours to complete. Aging, insufficient power grid – In recent years, the nation’s aging infrastructure has been an increasing cause for concern. The power grid is increasingly vulnerable as it is stretched to capacity. Sometimes, components like transformers, poles and decades-old electric lines are not upgraded in a timely fashion. Transformer failure – Sometimes, all it takes is a squirrel or other wildlife to enter a transformer. A resulting short may take out the transformer, knocking out power to all served by the unit. Cummins’ Quiet Connect series of backup generators automatically provide electricity just seconds after a power outage. A permanent system eliminates the limitations of portable generators. Portable models may not have the capacity to run all of your appliances, especially as you add more household equipment over time. Plus, any attempt to hook up a portable unit in the dark, during a severe thunderstorm for example, is often difficult or even dangerous. Gasoline-powered portable generators are of no use once the gasoline supply is exhausted. Getting more gas during extended power outages can be challenging and inefficient. An Indiana mechanic named Clessie Cummins started his namesake enterprise in 1919. Today, Cummins Inc. is a Fortune 500 company headquartered in Columbus, Indiana. Sales exceeded $19 billion in 2015. Today, Cummins employs approximately 55,000 individuals around the world. The company serves customers in 190 countries and territories. Cummins Power Systems is one of four business categories. The others are Cummins Engines, Components and Distribution. 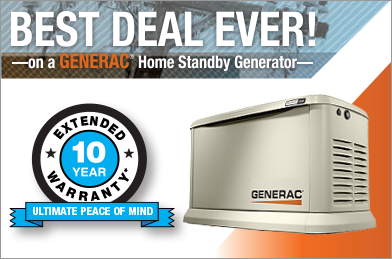 Midwest Electric & Generator is your source for the high-quality standby generators manufactured by Cummins. We provide our customers with comprehensive generator services, including sales, installation, service and maintenance. Work with us, and enjoy years of care-free generator performance. For a complimentary quote, please contact us today!